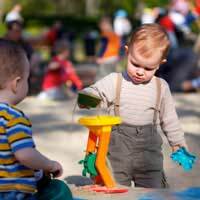 Children use play not simply as a fun past-time or a way to amuse themselves for a little while but as research into the world around them. When they are born, children can do very little for themselves and know very little about the world or their places in it. As they play, children come to understand more about the world and themselves and develop the physical, cognitive, emotional and social skills that they will need to live independently later in life. Through quiet, creative, active, cooperative and dramatic play children get the chance to work on these skills and more. Quiet play is an umbrella term for activities that do not require a lot of energy or space. Children particularly enjoy quiet play when they are tired, and many parents enjoy the lull that quiet play affords. Examples of quiet play include reading books, looking at nature, listening to soothing music and playing with imaginary friends. Quiet play helps to enhance children’s cognitive skills by offering them the opportunities, space and time to learn about the world and reflect on their discoveries. Creative play is a term used to describe activities such as acting, drawing, painting and sculpting that give children the chance to be in charge of their own world for a little while. Often this world is imaginary, such as when children play with pretend friends, which means that their cognitive skills are enhanced as they literally create another world for themselves, one in which they are in charge. If these made up worlds include other characters or tell a story (which is often the case with children’s art work), then children’s emotional and social development will be enhanced as well as them applying these skills to their new “stories”. Active play includes activities that require physical movements and allow children to burn off energy. Necessarily active play will enhance children’s physical development as it affords them opportunities to use their muscles and develop gross motor skills (those involving large muscle control), fine motor skills (those involving smaller muscle control) and general coordination and balance. Often active play is social as well, such as playing sports games or on sports teams, so it will also help enhance children’s social and emotional skills. Cooperative play always involves more than one person, so children must use social skills when playing cooperatively. Not only does this obviously enhance social development, but it allows children to develop cognitive and emotional skills as well. In learning new rules of cooperative play children must think about general societal expectations and fit them into their worldview, and they must also learn to keep their frustration at losing and joy at winning within reasonable levels thus enhancing their emotional development as well. Dramatic play is a phrase that describes another type of play in which children use their imaginations to become different characters or inhabit made up worlds. Dramatic play is a sophisticated form of play as it engages cognitive, social and emotional skills that require children to play with others, including imaginary friends and inanimate objects (dolls, toys, etc.) to which they ascribe personalities and other characteristics. This complex type of play may involve others, or be carried out alone by a solitary child. Each type of play in which a child engages will help enhance his/her physical, cognitive, social and emotional skills. Play, regardless of the type, is a child’s chance to practice the many skills that they have learned in “real life” and apply them in safe and fun settings. Children may also learn lessons during play that will pertain to other areas of their lives as well. Play, then, is more than just amusing – it is necessary for enhancing children’s development on all levels.